Home SECOND photo-color-advice, first one is free! Delivery time: Same day up to 2 business days from the day you mail us your picture and you sent us your payment (Paypal or credit card). Only exception: Payment through bank transfer, 2-5 business days, if bank transfer is submitted the day of your order. FIRST color check & advice is free! Book this offer only in case you need a second advice based on a new picture! 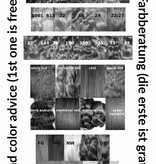 You have already ordered a custom color hair piece after your first color advice? Then you needn't book this offer, your advice is free! Many of our customers change their hair colors now and then and come back to get a hair piece matching their new color. This is why a new advice for a new order is free. 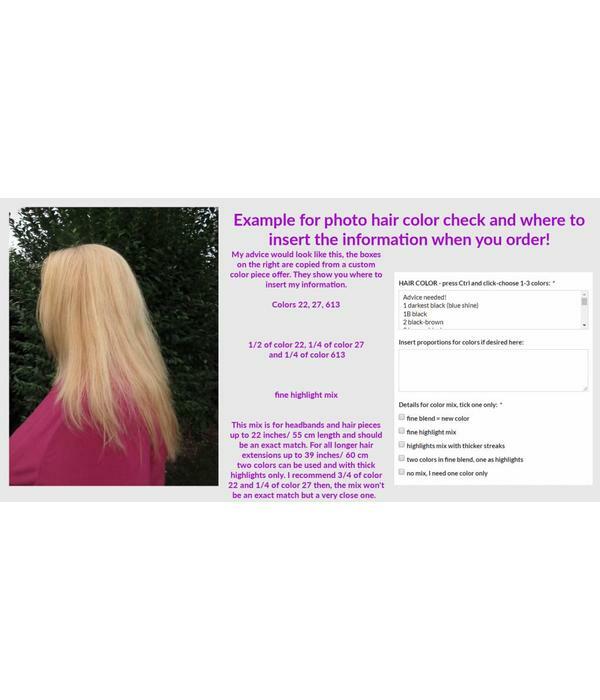 The photo hair color check is an alternative if the online color charts in each hair piece offer are not sufficient for you. 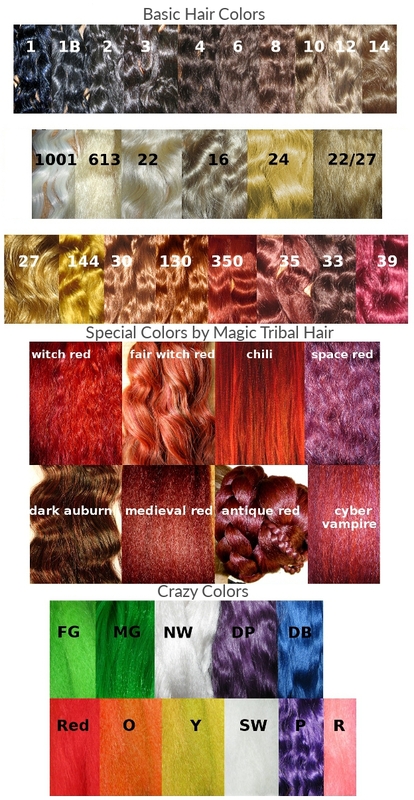 E-mail your picture to info@magic-tribal-hair.com! A photo color check works despite your hair looking different in different kinds of light, because the hair piece will change like your hair if we match colors in neutral light! So please take a picture according to our instructions further below, to ensure neutral light! 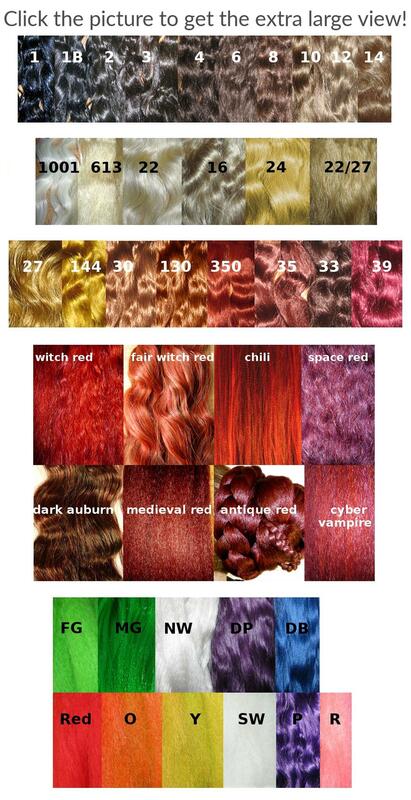 Important information about hair colors, please read! Your hair color can be matched perfectly including highlights, lowlights and all shades, because all our hair pieces are made to order exclusively! 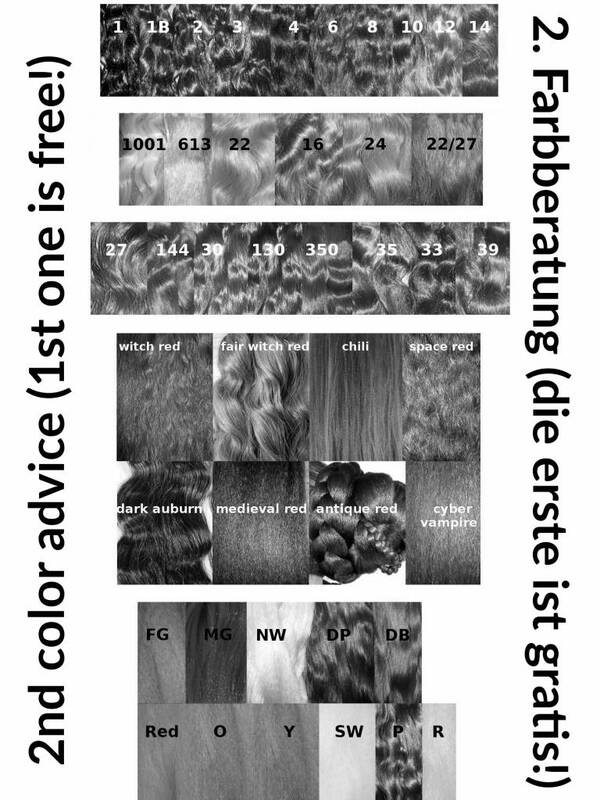 One's own hair usually contains 2-3 colors, only dark hair (colors 1-6) often consists of 1 color only. Hence we include up to 3 colors in the price for most hair extensions and you can add additional basic colors at little extra costs if needed. The only exception are our extra long hair pieces, 60-100 cm/ 24-39 inches long. Here only two basic colors can be mixed due to technical reasons with this extremely long hair. In many cases one of our basic colors is close to your hair color, so we would pick it as the basic color for your hair piece as well. Additional colors will make your hair piece look real, because they add shades, nuances, highlights and shimmer of your own hair to the hair piece. If your own hair is right in betweentwo basic colors, a fine blend ofthese two colors will be the basic mix for your hair color. We might need to add additional colors for highlights or a shimmer in this case, too. 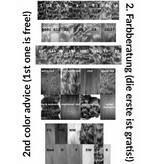 We have developed our own techniques, because working with synthetic hair differs strongly from having your hair dyed at your local hairdresser's. Your hairdresser blends the liquid color and applies it to your hair. We take bundles of hair in the basic hair colors we need for your hair piece, part them and put them together again until we have the desired mix. This time-consuming work by hand enables us to make thick streaks up to fine highlights. Or to get a fine blend which actually is a new color and you cannot recognize the single basic colors in this mix any more. So the technical side differs strongly from hair coloring at the hairdresser's but we get the same result! Just to give you an example: When we blend two fair shades of blonde and a copperish shade, we get a new shade of blonde with a slightly copperish shimmer. 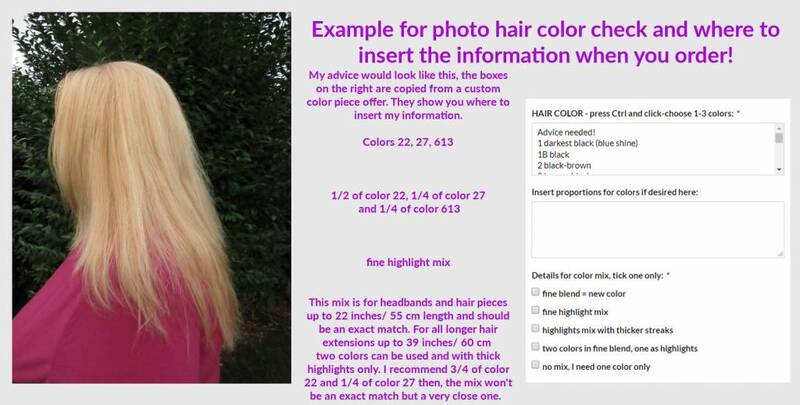 Mail us a picture of your hair (please pay attention to instructions further below!) we check for basic colors and mail or call you with the basiccolors you need. We will let you know the numbers, the proportions for each color and the kind of mix (highlights, fine blend etc.) we propose an you can check them in our picture charts online. 1. You agree with our advice and we make your hair piece accordingly. 2. You let us know which details of your advice you want to change and we make your hair piece accordingly. 3. 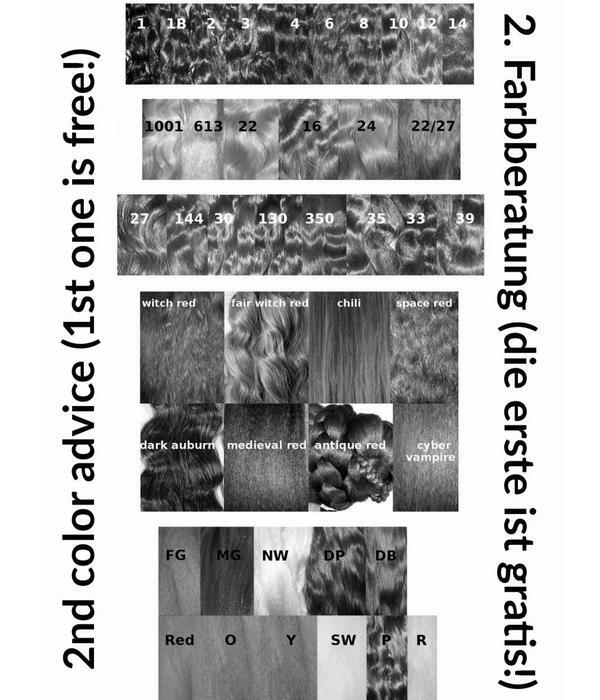 You check our advice live by ordering color swatches. There are offers in all hair piece sections in our shop. When do you need to book a 2nd consulting for your hair color? You indeed should need the first one only, if you mail us a perfect picture according to our instructions straight with the first one. We all have pictures on our phones and laptops, so our instructions are often skipped and customers send us pictures from their library. In most cases these pictures are sufficient for narrowing down the choice, but we cannot determine the exact mix with all details with them. In these cases you either have to determine the details we need for your hair piece yourself or book a second consulting at extra costs and send us a clear picture according to our instructions. You can use your phone or a regular camera, but we need a large picture, minimum resolution is 600 px for shortest side, the larger the better! Don't use a flash! Natural daylight, no extreme light conditions light full sun or deep shade, a cloudy day is perfect. Take the picture with the stream of light! Your hair color looks different in different kinds of light, your hair piece should change the same way, so we must match it in this most neutral light situation! Your entire open and dry hair (any close-ups or details shots of a strand only, any pictures with hats or fascinators, braids, updos, pony- or pigtails!). You must be the only person, any party or group pictures! Take the picture from the side or the back, you should be seen from the top of your head until the middle of your back, different color shades can be recognized much better from a little distant perspective. If you can't but take a selfie, use a selfie stick! If you wish to send us several pictures, please add which one we should use for our advice and which ones serve as additional information only. 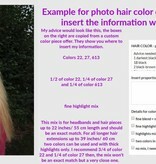 This is necessary, because only you know your real hair color so only you can determine which picture reflects it best. Mail your picture to info@magic-tribal-hair.com after booking and paying for your second color consulting. We will contact you upon receipt of payment. Please contact us for any questions about our custom color hair pieces or color consulting!